Reforming education alone will not revitalize lower income communities across the US. Creating meaningful career paths and job opportunities for young people of color provide the best motivation for their continued focus on schooling and educational persistence. 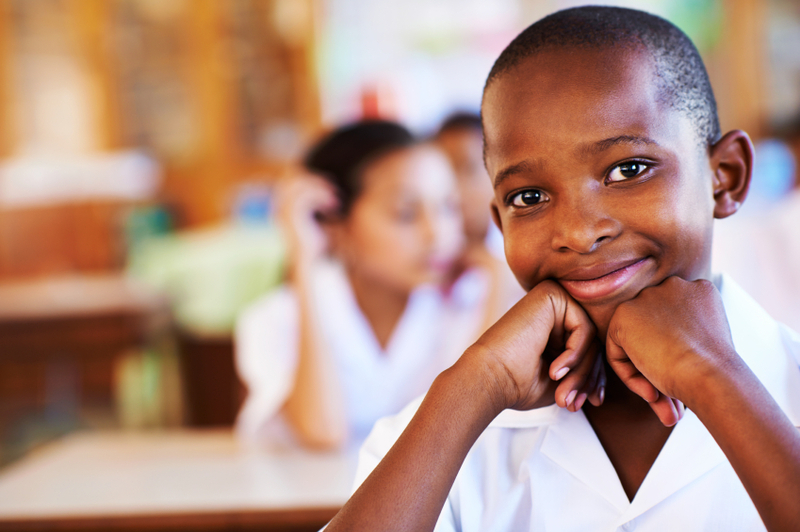 Education reform policies that ignore job creation in lower income communities may incrementally transform failing schools but have negligible impact on the future lives of students once they are beyond K – 12. Incrementally improving education for young people of color without addressing the issues related to the scarcity of career path jobs in and outside of their communities gives them a false hope of opportunity where none may exist. The unintended consequence of creating unrealistic expectations may add to rising social frustration that may lead to retaliation from a better educated but persistently unemployed group of young men and women. Policy makers should not take their eyes off the prize. That prize is equal access for ALL to the tools required to realize the American dream. ALL also includes children of color, lower income families, students from rural communities and those that have been stuck running in place in neglected and forgotten neighborhoods across the country. The pace of change in the world is accelerating. Global growth is vigorous. World regions that were once far behind the US are flying ahead in many ways. That is why America’s failing neighborhoods, like its failing schools, need aggressive step-wise change NOW. An incrementalist approach will doom these communities to be continual laggards as the world of global trade moves rapidly forward – increasing the already wide gap between America’s rich and poor. We need – a transformation in spirit and focus – like the 1960s “Moon Shot” launched by President Kennedy. We need a vision that is national, bold, challenging and able to unite the many sectors of American society to strive for an end goal out of immediate reach but within range of the American imagination. We offer one concept for that Moon Shot that could transform many communities throughout the US. 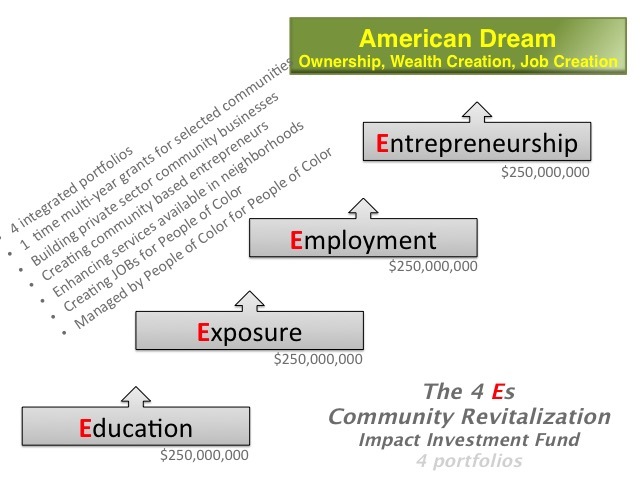 The 4Es Community Revitalization Impact Investment Fund – $1,000,000,000. The challenges that the US is facing when it comes to the issues of race relations, dealing with rampant income inequality and fixing an education system that has been in systemic decline are being debated daily across the country. There are a few that will argue against the need for change, especially onlookers that are far removed from the day-to-day lives of those struggling with financial insecurity and persistent joblessness. Understanding that the world was round and not flat also took time for people to recognize until a tipping point occurred when proofs were so many that the naysayers were in the minority. The proof of America’s racial and social inequities is all around us today and the near weekly broadcast of unarmed Black men shot dead by police must be a tipping point. Most people of color are highly attuned to news stories, articles and TV shows in which Black and Brown people are involved. For them the US seems to be engulfed in racial tension, indifference and cultural disrespect. There are so many examples of “in your face” injustice that are occurring. Too many people of color have already given up or given in, becoming yet another tragic statistic themselves. Others are fortunate enough to have navigated their way into relative economic stability and have separated themselves from the survivalist struggles endured by far too many families of color in lower income neighborhoods. For those mainstream Americans that think that these claims of systematic institutionalized racism are mere whining from an underclass that would rather “take” from the government then fend for itself, consider the following facts of life for many lower income families that are trying to find their way in the US. Imagine, as you consider this list, that your family was living within communities plagued by these ever present and well documented realities. Lack of Meaningful Job Opportunities – Unemployment for Black men has been consistently reported as more than twice that of their white counterparts for decades. Many believe this ratio to more likely be 3 times the national unemployment rate if all those that have opted out and stopped looking for work were counted in the statistic. Communities in Crisis – Many lower income inner city communities are plagued by escalating violence where gun fatalities are a way of life. The death toll on the streets of the US are far greater than reported US military deaths within any of the battle fronts in the mid east. Predatory Lending Practices – For those Black families that had amassed a small amount of savings and considered buying a home, the predatory lending practices of many large banks led to the financial crisis that decimated home values resulting in foreclosure damaging a generation of young people’s credit. Lack of Access to Business Capital – Even the best and brightest prospective entrepreneurs in Black communities, taking on the challenge of creating jobs, wealth and new services, are often denied access to business capital from banks, private equity investors and other sources that have been traditionally used to “seed” new business ventures. These issues are not new. A prior blog entry provides evidence that in the early 1960’s similar issues of injustice moved President Kennedy to create a path that led to landmark Civil Right Legislation. But more than 50 years later a recent movement called Black Lives Matter, has challenged the nation to review its position on racial justice – past and present – and to face the inconvenient and uncomfortable truth of oppression that has held back generations of people of color in the US. There are whole industries created to help the poor. Many of the people that work in them have never been poor themselves. Many do not live the day-to-day survival existence faced by large sectors of our society. Many large not-for-profit organizations’ sole source of revenue is government funding funneled through multi layered inefficient bureaucracies armed with a legislative mandate to help the poor survive in communities where the challenges described above are well known and well documented. But funding survival alone is not enough. We need a “Moon Shot” approach to “seed” sustainable economic growth through encouragement of a new entrepreneurial spirit. Young entrepreneurial leaders of color must be given the support needed to rebuild their communities. Yes there has been progress in the past 50 years and there continues to be progress today. But the pace is too slow. At this rate of improvement, lower income communities will be forever relegated to be dependent on government and to be non-participants in the future economic growth of the country. And if we believe that global competitiveness will remain an issue in the near term then we must act now. Incremental change in these neglected and forgotten communities will clearly hold back our overall national progress, dragging down our global competitiveness. Fiscal conservatives should be able to join with liberals in the recognition that it is time that we radically transform communities bringing a new sense of self reliance that creates tax makers rather than tax takers. Launch a private sector national impact investment fund focused on “kick starting” economic growth within communities of color. Using an integrated portfolio approach, select specific communities of focus to rebuild by “seeding” community entrepreneurs, young businesses, education reform activities, and community development in the arts and music. The fund’s goal should be simple. Finance a new era of economic self reliance in communities that have been neglected, where poverty and joblessness have been persistent. In the process rely on the best and brightest people of color to lift themselves and their neighborhoods by their boot straps through business formation aimed at enhancing the lives of people in the community – bringing new skills, finance and career focused jobs. The top 50 American Billionaires have a net worth of just over $1 trillion dollars. The private equity market has just had one of its best years in 2014. Perhaps there are some willing to work with leaders of color and pilot a new vision for community re-investment. One that is not a hand out but instead a hand up. We need the American Billionaire class to step forward, recognizing the role it can play in fueling a new era of AMERICAN economic growth through integrated and targeted impact investing – community by community – neighborhood by neighborhood. Is it too much to imagine that from the pooled wealth of 50 of America’s billionaires we can fuel a pilot with 4 investments of $250MM or 8 investments of $125MM? Do the math – the percentage contribution is small. What is clear is the money is out there as it is applied daily to the many causes of concern to wealthy donors. We need to make lower income community revitalization the cause célèbre for our nation now. The need for bold action is clear. Catalyzing the good intentions of many, the wealth of a few, and the understanding and experience of those that have lived the transition from poverty to prosperity is what is needed. Perhaps the concept of the 4Es Community Revitalization Impact Investment Fund can be considered one means to move a stalled and neglected generation rapidly forward, to a place where economic participation and self reliance become the new norms. Incrementalism will not get us there – we need a Moon Shot now.